Germany’s KOMET GROUP is one of the world’s leading suppliers of precision cutting tools and has supplied innovation to the machining industry for almost 100 years. The Group, which has its headquarters in Besigheim, currently employs more than 1,500 people, including its subsidiaries, and is represented in around 50 countries. KOMET GROUP is a global technology leader in the fields of high-precision drilling, reaming, milling, threading and process monitoring. In addition to developing, manufacturing and distributing high-quality premium products, the company uses its years of technical know-how to analyse customers’ production processes, right down to the smallest detail, and then develop tailored solutions to help them achieve greater efficiency for all stages of their machining. With such a strong focus on innovation and continuous development, it was perhaps inevitable that KOMET GROUP staff would come up with some tooling designs that were too expensive, or even impossible, to make with conventional manufacturing methods. As a result, Dr Reinhard Durst, Research and Development Manager for hard metal tools at KOMET GROUP, has been investigating the potential of additive manufacturing for tooling production and the equipment available on the market for several years. 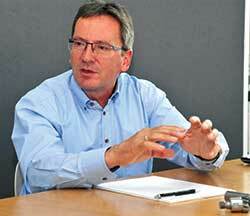 Dr. Durst has been working with Renishaw for the last year, “because its offer has convinced us from a technical as well as an application point of view.” This transfer of knowledge and know-how is inherent throughout Renishaw’s new and growing network of Additive Manufacturing Solutions Centres. Before buying the machine outright, customers can lease the latest Renishaw equipment at a Solutions Centre and work independently on their projects. Renishaw staff are always available to provide advice on the use of the machines. In this way, potential customers can familiarise themselves with additive manufacturing technology, with expert help on hand, and discover how it might meet their specific requirements, without the need for a large up-front investment. 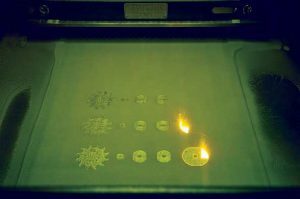 Renishaw’s metal additive manufacturing system uses laser powder bed fusion technology in an inert argon atmosphere. An extremely thin bed of metal powder is laid down and areas that will form the component are melted using a high performance ytterbium fibre laser and then solidified on cooling. This process is repeated with layers of metal powder, typically between 20 and 60 μm thick, until the part is finished. The thinner the layers, the better the accuracy and surface quality of the finished part. 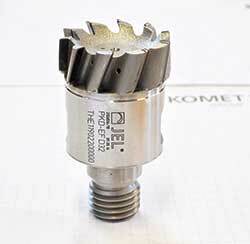 The first of the projects handled jointly between Komet and Renishaw was the development of a new range of PCD (Poly-Crystalline Diamond) screw-in milling cutters. 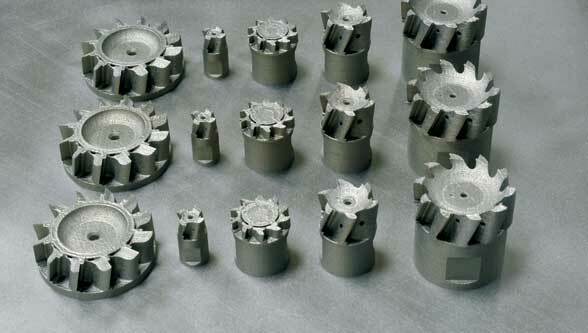 The main bodies of the cutters are manufactured on a Renishaw metal additive manufacturing system, with multiple bodies produced during each cycle of the machine, and then fitted with PCD blades and screwed onto their tool holders. The use of the Renishaw technology to manufacture the tools allows geometries to be produced that would be almost impossible by conventional means. “Thanks to the additive process we have been able to place many more PCD blades on each tool,” explained Dr. Durst. “We have changed the arrangement of the blades and achieved a substantially greater axis angle. Compared to conventional milled tools, we have greatly shortened the grooves. These changes mean that the tool is a lot more productive for the user.” For example, with a 32 mm screw-in head, the number of grooves and blades has been increased from six to ten, achieving a feed rate that can be up to 50% higher. In addition, the ability to optimise the paths of the coolant channels ensures that each cutting edge is supplied precisely with coolant through a separate channel, while the external design of the bodies helps to ensure that chips are removed reliably from the face of the tool. AM also offers the potential to reduce component weight since material can be used only where it is necessary for the optimum functionality in the component. It also outperforms conventional production methods in terms of delivery time for any special or experimental tools needed by Komet’s customers.